Cities the world over were founded strategically—often for their closeness to water. So it makes sense that many offer beautiful panoramas of buildings along an ocean, river, or lake. Some feature mountain backdrops as well. But let me tell you: Cape Town may trump them all. When you’re wondering, “Why go to Africa’s southwestern edge?” start with the scenery. We’ll be living in Cape Town for 10 weeks, and we’re getting to know the food, music, culture, and people. But even if you have much less time for all that, it’s worth coming for the inspiring landscapes alone. Our studio has both mountain and water views—and that’s not unusual. 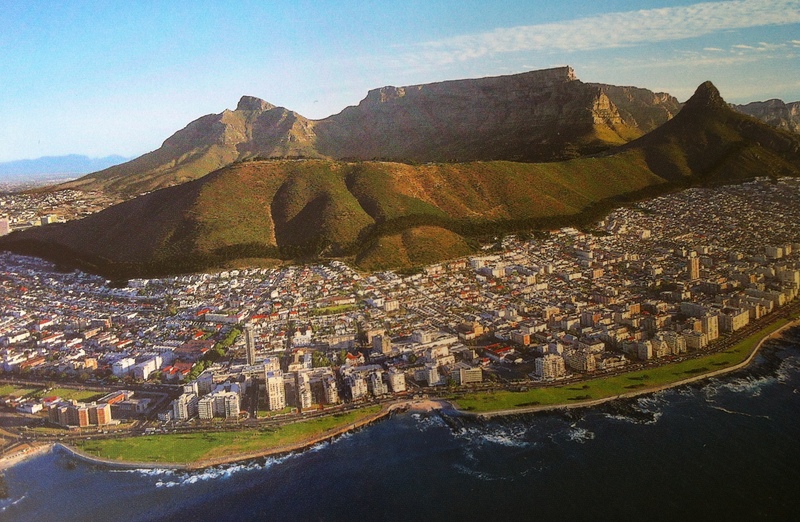 Eight-hundred-million-year-old, 3,000-foot-tall Table Mountain is justly famous. Its long, jagged base and flat top are unique and impressive. But it’s also framed by two peaks, Devil’s Point and Lion’s Head, that are equally wild and cool. The city center is called the “city bowl,” and it’s a bowl along a bay. Buildings then wrap around Signal Hill, between the ridge and the coast. There’s an amazing running-walking path there, the Sea Point Promenade, where you can watch the Atlantic waves crash into the African rocks. The climate is considered mild Mediterranean. Humidity is low. And luckily for a city of 3 million, the prevailing wind (nicknamed the “Cape Doctor”) seems to blow any fumes out, and pull fresh ocean air in. Even now, in winter, temperatures range between 50s-70s F, and I’m told the summer average is 79 F. The Cape Town climate is often compared to Santiago, Barcelona, or L.A. There is much more to Cape Town around the harbor in the opposite direction from Camps Bay, as well as on the Cape flats behind Table Mountain. We haven’t explored those yet. But even if you or I hardly got out of the main city, Cape Town’s scenery would still be worth the trip.